Sign at Goodmans Hardware last week: (By the way, I love Goodman’s. 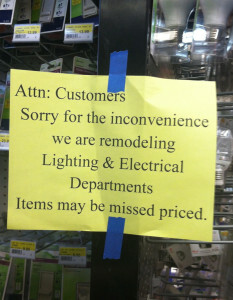 Just had a laugh over this since there were about 20 of these signs posted around.” Attn: Customers Sorry for the inconvenience we are remodeling Lighting & Electrical Departments. Items may be missed priced. Weird Sign – skidding bicycle?